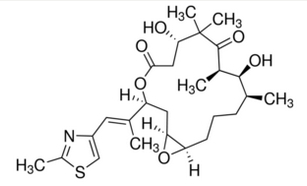 Epothilone A is a microtubule (MT) stabilizing drug and natural macrolide antitumor from myxobacteria Sorangium cellulosum. EpoA exhibits kinetics similar to paclitaxel by inducing tubulin polymerization in vitro and producing enhanced microtubule stability and bundling in cultured cells. In contrast to paclitaxel, Epothilone A exhibits a greater cytotoxicity against P-glycoprotein-expressing multidrug resistant (MDR) cells (IC50 = 20 nM for MDR CCRF-CEM/VBL100 cells). Epothilone A is a competitve inhibitor of 3H-paclitaxel binding with comparable IC50 to paclitaxel in displacement competition assays. EpoA causes cell cycle arrest at the G2/M transition leading to cytotoxicity. 1. Schinzer, D. et al: "Total Synthesis of(−)-Epothilone A". Angew. Chem. Int. Ed. Engl. 36 (5): 523. (1997). 2. Nicolaou, K.C. et al: "Total Syntheses of Epothilones A and B via a Macrolactonization-Based Strategy". J. Am. Chem. Soc. 119 (34): 7974 (1997). 3. Höfle, G et al:. "Epothilone A and B—Novel 16-Membered Macrolides with Cytotoxic Activity: Isolation, Crystal Structure, and Conformation in Solution". Angew. Chem. 35 (1314): 1567 (1996).